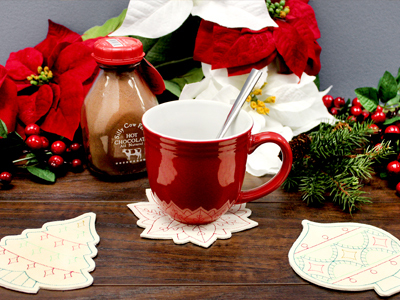 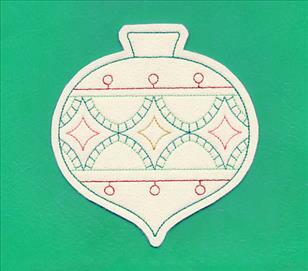 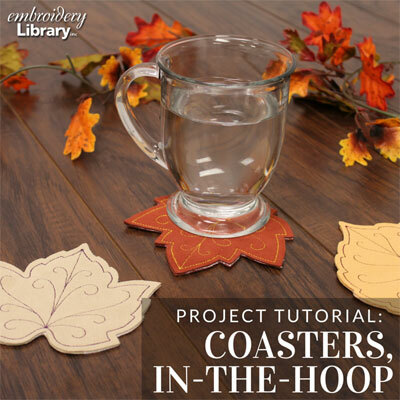 Add a seasonal look to your dining table with in-the-hoop coasters. 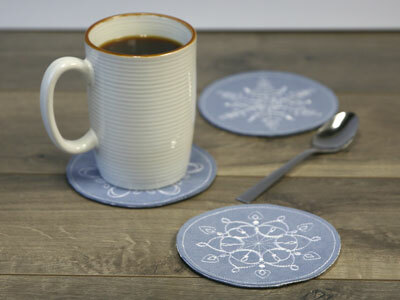 The coasters are stitched in elegant UltraSuede fabric and are a gorgeous way to protect your table from drips and spills. 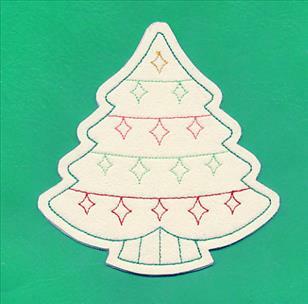 Comes in autumn, winter, and Christmas themes! 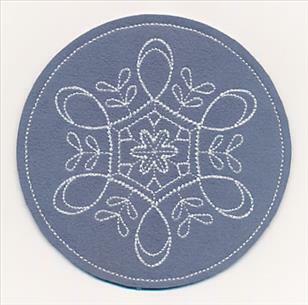 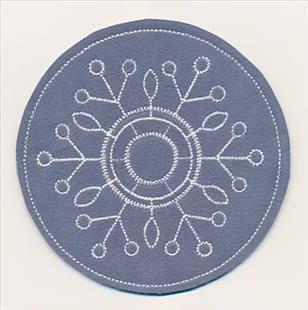 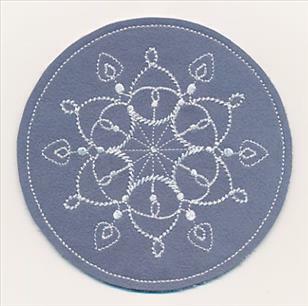 Use UltraSuede or felt for best results, as the edges of the coaster are raw. 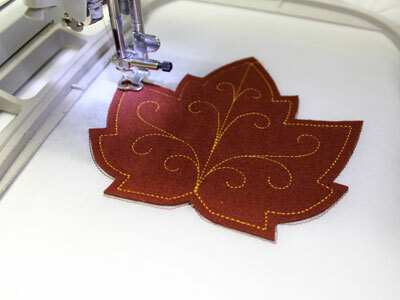 Using these types of fabric will ensure that the fabric will not fray. 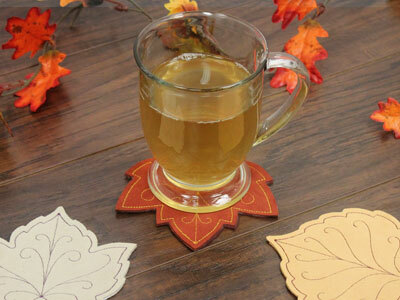 Seasonal coaster designs have three files. 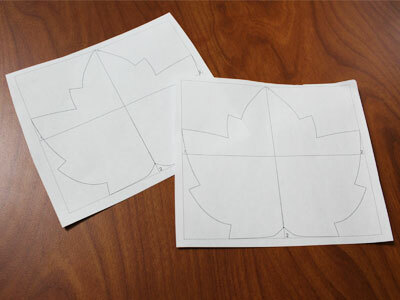 Spray the backside of each dieline printout with temporary adhesive. 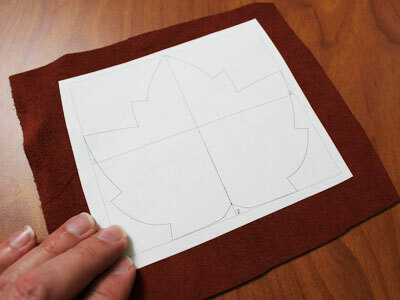 Smooth each the dieline onto a piece of UltraSuede. 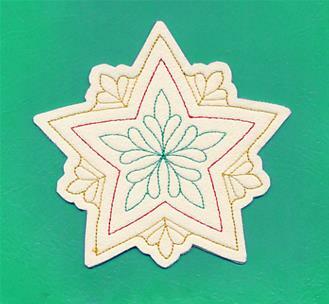 A running stitch tack down will sew next. 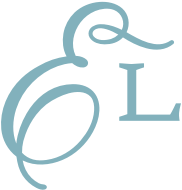 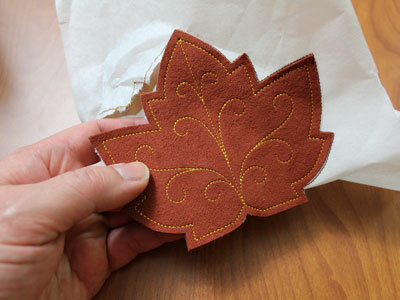 This binds the fabric in place for the remainder of the design. 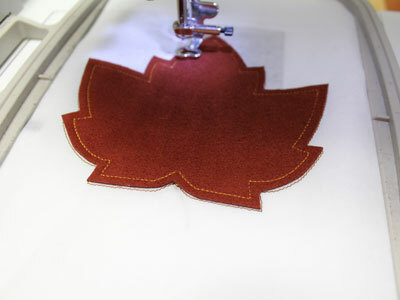 On the color change sheet, look for the note that says "finishing seam." 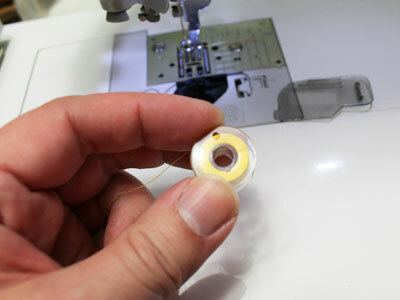 When you get to this section, stop the machine and remove the hoop from the machine. 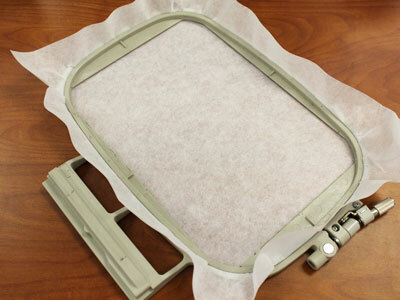 Do not unhoop the stabilizer. 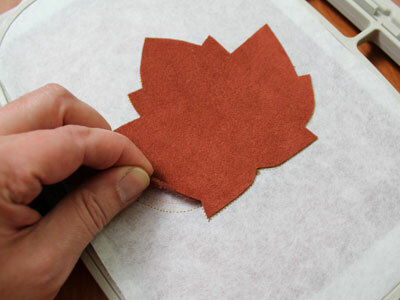 Turn the hoop over and spray the backside of the back piece with temporary adhesive. 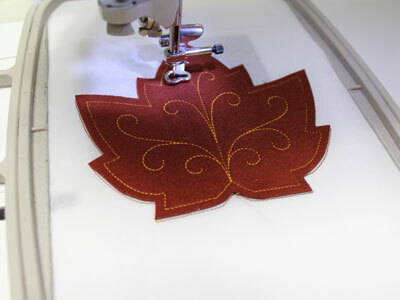 Place the back piece within the shape on the back of the embroidery. 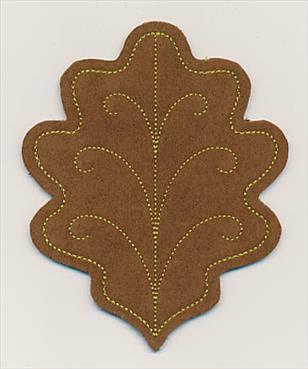 A running stitch tack down will bind all the layers together. 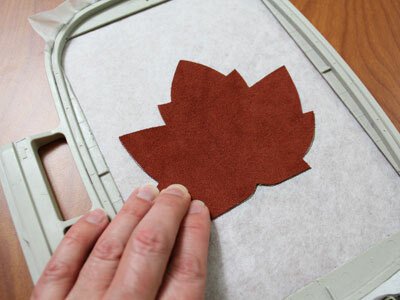 If any bits of the stabilizer are still showing, carefully pull the layers of UltraSuede apart and trim away the stabilizer. 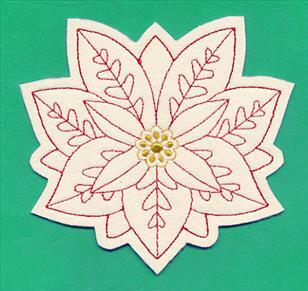 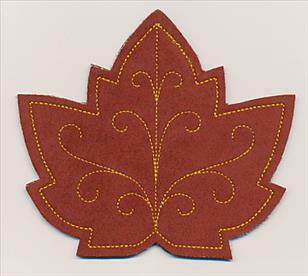 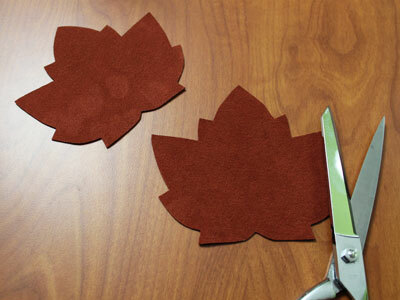 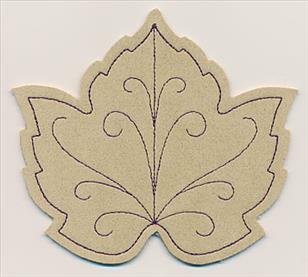 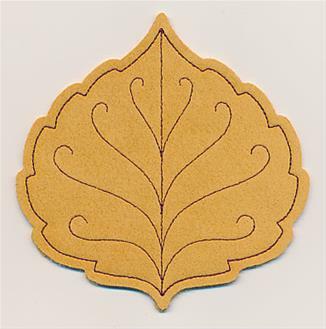 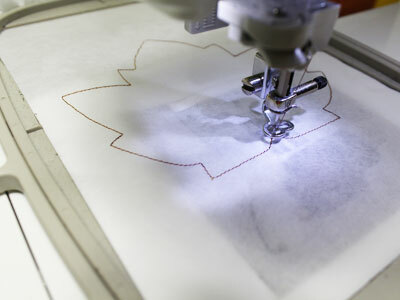 Change the color of the Ultrasuede fabric to stitch these leaves for spring or summer. 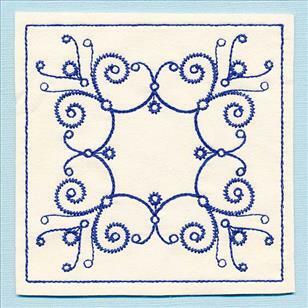 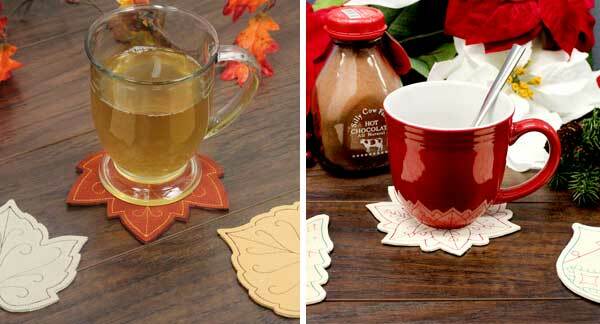 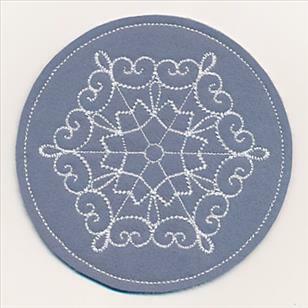 Christmas versions of these sophisticated coasters bring an elegant look to your holiday dinner parties and decorating. 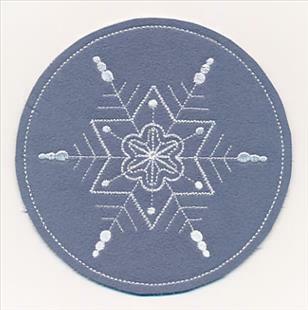 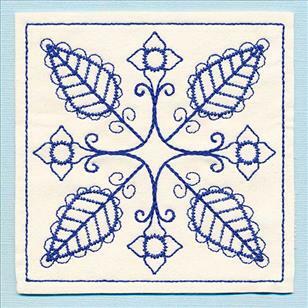 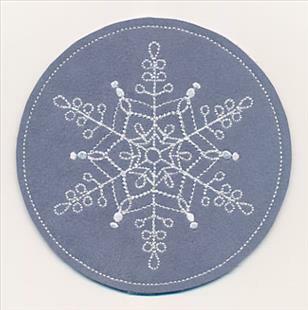 And add a frosty look to your dinner table with winter coasters decorated with a flurry of snowflakes. 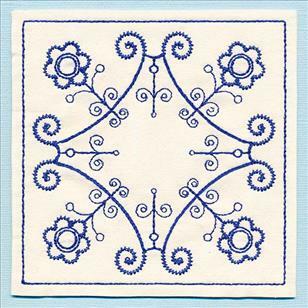 4.84" x 4.85" | 3.85" x 3.86"
4.85" x 4.32" | 3.84" x 3.43"
4.77" x 4.85" | 3.78" x 3.84"
4.84" x 4.30" | 3.84" x 3.41"
3.92" x 4.86" | 3.10" x 3.85"
4.65" x 4.85" | 3.68" x 3.84"
4.84" x 4.66" | 3.83" x 3.70"
4.51" x 4.85" | 3.57" x 3.84"
4.85" x 4.52" | 3.84" x 3.58"
4.84" x 4.85" | 3.85" x 3.85"
4.84" x 4.85" | 3.84" x 3.85"